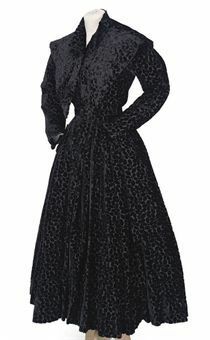 the floral devoré velvet dress with full skirt and long sleeves, with original belt, and dramatic detachable collar descending to a deep point. Labelled: Eisa (3). Literature: Jouve and Demornex, 'Balenciaga,' Rizzoli NY, 1989; and Jouve, 'Fashion Memoir: Balenciaga,' Thames & Hudon, 1997, p14. Notes: The same model made up as a coat, with its distinctive collar, was photographed by Irving Penn, and featured in Vogue in 1950. Anne Bullitt Biddle was clear in her specifications, often altering presented styles to her own figure and needs. Here she has had a coat redesigned into a dress.